Posted On February 7, 2016 by &filed under Top Law News. 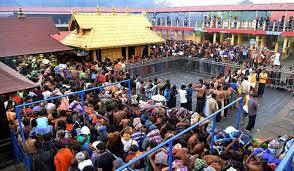 The Kerala government has told the Supreme Court that banning entry of women of menstrual age in historic Sabarimala temple in the state is a “matter of religion” and it is duty bound to “protect the right to practice the religion of these devotees”. In an affidavit, the state government said administration of the temple vests with the Travancore Devaswom Board under the Travancore-Cochin Hindu Religious Institutions Act and the decision of the priests is final in the matter of worship. “In the context of Sabarimala, the administration vests with the Travancore Devaswom Board under the provisions of the Travancore-Cochin Hindu Religious Institutions Act, 1950. Under the Act, there is a statutory duty cast on the Board to arrange worship in temples in accordance with the usage. Therefore, in matters of religion, it is the opinion of the priests that is final,” the affidavit filed by state chief secretary Jiji Thomson said. A bench of Justice Dipak Misra and Justice NV Ramana would take up the matter on February 8. 118 queries in 0.300 seconds.